On March 8, 1998, one male fire fighter, the Captain on Engine 57 (the victim), died while trying to exit a commercial structure after his egress was cut off by the wooden trussed roof that collapsed. Task Force 66 was the first on scene and reported light smoke showing from a one-story commercial building. A ventilation team from Truck 66 proceeded to the roof of the building and commenced roof ventilation. Forcible entry into the building required about 7 ½ to 9 ½ minutes from arrival on scene to force open the two metal security doors in the front. While fire companies waited for the security doors to be opened, fire conditions changed dramatically on the roof. Fire was coming from the ventilation holes opened by the ventilation crew. As soon as the security doors were opened, three engine crews (Engine 66, Engine 57, and Engine 46) advanced hand lines through the front door in an attempt to determine the origin of the fire. Approximately 15 feet inside the front door, the fire fighters encountered heavy smoke with near zero visibility conditions. The engine crews advanced their hose lines approximately 30 to 40 feet inside the building. consider placing a bright, narrow-beamed light at the entry portal to a structure to assist lost or disoriented fire fighters in emergency egress. 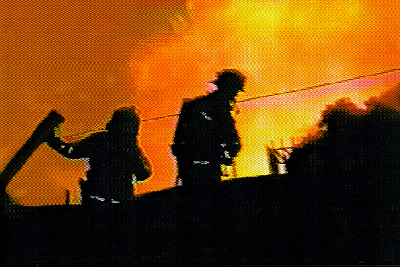 Two firefighters are shown silhouetted against the flame and smoke at the fire scene. On March 8, 1998, a 38 year-old male fire fighter, the Captain on Engine 57 (the victim), entered a commercial structure with heavy smoke and flames emitting from the roof. The victim, along with several other fire fighters, entered the structure through the front door while additional fire fighters continued to ventilate the wooden, arched-truss roof. While the fire fighters exited the building due to deteriorating conditions, the victim became disoriented, his self-contained breathing apparatus (SCBA) ran out of air, and his egress was eventually cut off by a partial collapse of the wooden trussed roof. Approximately 22 to 24 minutes after he entered the building, the victim was found unresponsive. On March 16-18, 1998, an investigation of this incident was conducted by Ted A. Pettit, Chief of the Trauma Investigations Section, and Richard W. Braddee, Frankie C. Washenitz, and Tommy N. Baldwin, Safety and Occupational Health Specialists. Meetings were conducted with members of the fire department’s Significant Incident Investigation Team (SIIT), Battalion Chiefs, Assistant Chiefs, Training Chiefs, fire fighters responding to the incident, and the IAFF union representative. Copies of photographs from the incident site were obtained from the fire department along with an estimated time line of the incident. Training procedures and a preliminary report prepared by SIIT were reviewed, and a videotape from the fire scene and a transcription of dispatch tapes were obtained. A site visit to the incident scene was conducted. The fire department involved in the incident serves a population of 3½ million in a geographic area of 470 square miles. The fire department is comprised of approximately 3,300 employees, of whom 3,026 are fire fighters. At their fire academy, the fire department provides all new fire fighters with the basic 20 weeks of training that covers National Fire Protection Association (NFPA) Fire Fighter Level I and the majority of NFPA Fire Fighter Level II. The training is designed to cover all areas of fire departments operations, including fire safety, state and federal codes, fire behavior, fire protection and safety, and self-contained breathing apparatus. Refresher training courses are continued throughout the year during each shift. The fire department’s written standard operating procedures manual was reviewed and appeared to be complete. The victim had 17 years of fire fighting experience. On March 8, 1998, at 0220 hours Pacific Standard Time, Battalion 13 and Task Force 66, which included Engine 66 (Captain, Engineer, and two fire fighters), Engine 266 (Engineer), Truck 66 (Captain, Apparatus Operator, and three fire fighters) and Rescue 866 (two fire fighter/emergency medical technicians) received the initial dispatch of a reported structure fire. Also responding were Engine 57 (Captain, Engineer, and 2 fire fighters), Engine 46 (Captain, Engineer, and 2 fire fighters), and Engine 34 (Captain, Engineer, and 2 fire fighters). Light Force 26 was also dispatched and was later replaced by Light Force 33 which included a Captain, Apparatus Operator, Engineer, and 3 fire fighters (a light force is a truck and 200 series engine, i.e., Truck 33 and Engine 233). At 0222 hours, Battalion 13 and Task Force 66 arrived on scene and reported light smoke emitting from a one-story commercial building that measured 110 feet long by 59 feet wide, which contained a dog treats preparation operation. At 0223 hours, four members from Truck 66 (Captain and three fire fighters) went to the roof, via a 35-foot ground extension ladder, to start ventilation procedures as one of the fire fighters (Inside Member) of Truck 66 went to the front security door to evaluate entry conditions. As the ventilation crew went up the ladder, they noticed several windows on the south side of the building through which they could see fire in the ceiling area, which they reported to incident command. When they reached the roof, they reported grayish brown smoke emitting through a roof vent. Engine 57 arrived on scene at 0224 hours and was assigned to assist with backup as soon as the Inside Member of Truck 66 made entry into the building. Truck 66’s Inside Member began to make forcible entry through the front metal security door of the building using a rotary saw and then by kicking the door. During this time, two members from Engine 66 retrieved a 1¾-inch handline off the pumper and laid it out by the front door. At approximately 0226 hours, Engine 33 arrived on scene and, after several minutes, assisted Truck 66’s Inside Member at the front door. A fire fighter from Engine 33 used a sledgehammer to beat open the front door. The total process of gaining entry into the structure took approximately 7 ½ to 9 ½ minutes from the time companies arrived on the scene. As Truck 66’s ventilation team approached the center of the roof, they saw fire coming from a vent. The ventilation team opened an initial hole, approximately 4 feet by 4 feet, but was driven back by heavy fire and heat (see diagram A). By 0226 hours, members of Truck 66 were on the roof and reported the fire was somewhat heavy near the center ventilation hole. Even though flames were showing through the roof, they stated the roof still felt solid. Due to changing conditions, Battalion 13 requested two additional task forces at approximately 0226 hours, and Operations Control Division (OCD) dispatched Division II and Battalion 3 to the scene (the aforementioned units were delayed due to equipment failure at the OCD). Between 0230 and 0232 hours, after gaining entry, the Captain and two fire fighters from Engine 66 advanced a 1¾-inch handline through the front door, followed by the Captain and two fire fighters from Engine 57 with a 1½-inch handline, and the Captain from Engine 46 with a 1¾ inch handline. A 15-foot long hallway with offices on one side and a storage area above led from the front door to a door into the manufacturing area. Approximately 15 feet inside the front door, the companies encountered heavy smoke conditions with near zero visibility, but little heat. Due to considerable storage inside the building, advancing the handlines was very difficult due to 55 gallon drums (some empty and some containing dog treats) that were stored at the plant. At 0231 hours, a Captain and two fire fighters from Engine 33 advised the IC they had 10-foot pike poles and were going in with fire attack to help pull ceilings. Fire fighters from Engine 66 and Engine 46 advanced their hose lines 30 to 40 feet inside the building but found no fire (see diagram B). As Engine 57’s inside members advanced into the structure, their Engineer stayed in the hall area and helped advance the hose line. Engine 33’s inside members advanced beyond the office area into the manufacturing area, and they raised their pike poles to touch the ceiling or roof. The pike poles proved ineffective since the fire fighters were beyond the mezzanine area which was 6 to 13 feet above the office area. Interior fire fighters reported they could hear the saws on the roof and knew that ventilation was taking place, but the heat and smoke level was intensifying as they advanced into the structure. At 0232 hours, the Captain from Truck 66 advised Battalion 13 that they were getting real good fire out of the roof and were getting off. Captains on the interior radioed Battalion 13 that they couldn’t seem to find the fire; however, they were still advancing. The victim and the Captain of Engine 46 met on the inside of the structure and determined they were not making progress locating the fire. After speaking with the Captain (the victim) and considering the deteriorating conditions, the Captain on Engine 46 ordered a retreat and his crew to follow their hose line to exit. The crew attempted to follow hose lines on the floor to locate the exit; however, hose lines were tangled on the floor, creating a problem on exiting. The victim (Captain of Engine 57) also ordered his crew to exit the structure. At 0236 hours, Battalion 13 advised all the interior companies to withdraw from the structure due to information received from the roof and the interior crews; however, the Captain of Engine 46 on the interior did not hear the order to withdraw. Engine 57’s crew stated they could walk slightly bent over, but felt heat coming down from above, and there was no visibility. The crews also stated that they were within touching distance of each other throughout the operations. The members of Engine 57 exited with the victim leading and the remaining two fire fighters following. The victim began walking toward the exit as the Nozzle Man of Engine 57 started lifting the hose to bring it out with them. The middle fire fighter made physical contact with the victim to verify his location and then went back to help the Nozzle Man. After pulling the Nozzle Man in the direction of the victim, the middle fire fighter again made physical contact with the victim and proceeded forward. As the two fire fighters followed the victim to exit the structure, the middle fire fighter lost physical contact with the Nozzle Man for a second time. The middle fire fighter let go of the victim and reached back to pull the Nozzle Man. After making physical contact with the Nozzle Man again, the middle fire fighter reached forward to locate the victim. The middle fire fighter could not physically locate or make any verbal contact with the victim. The Nozzle Man yelled for the victim four times but did not receive an answer. The Nozzle Man related that he heard a SCBA low-air alarm sounding, which he thought was the victim’s. The Nozzle Man and fire fighter from Engine 57, without their Captain (victim), dropped down to locate a hose line to guide them out. The Nozzle Man and fire fighter of Engine 57 stated that as they were following the line out they discovered that they were going back into the structure when they reached the nozzle. They immediately turned around and followed the same line out. The fire fighters stated that the hose lines inside were tangled together, making the hose line hard to follow (see diagram B). At this point the middle fire fighter stated that he spotted a light, and both members crawled toward it with the Nozzle Man following. It was the flashlight of Engine 57’s Engineer. Upon their exit, the Nozzle Man and fire fighter asked if their Captain (victim) had made it out yet, and the Engineer of Engine 57 responded saying their Captain (the victim) had not come out. A fire fighter from Engine 33 who became disoriented and was having trouble exiting, activated his radio’s emergency trigger which signaled OCD he was having trouble on the interior. At 0238 hours, Battalion 13 was advised that Engine 33 needed assistance on the inside and that a fire fighter from Engine 33 was having trouble exiting. At approximately the same time, the other two members of Engine 33 exited the structure and discovered they were missing a member. The Engine 33 Captain (with a low amount of air) retrieved a flashlight from Engine 57 and re-entered the structure in search of his fire fighter. Within a few seconds, the Captain of Engine 33 found his missing fire fighter and they both exited the front of the structure at approximately 0239 hours. Also at this time the Division 2 Assistant Chief advised OCD he was on scene and would assume command. By approximately 0242 hours the roof had fallen in and was blocking the front entry into the manufacturing area where the fire attack companies had just exited. After the Nozzle Man and fire fighter changed their air bottles, the Nozzle Man of Engine 57 went back to the front entrance with another fire fighter and a 2½ inch hose line. Their hose line and those operated by members from Engine 66, Engine 46, and Engine 33 proved to be ineffective because of the volume of fire in the entrance area. The Captain from Engine 33 stated that at approximately 0243 hours, he informed IC in a face to face conversation that the Captain on Engine 57 (victim) was missing and still inside. This was not confirmed by the Command Post Staff. At approximately the same time, the IC radioed companies on scene and asked if someone could give him a status on Engine 57. Engine 66 radioed the IC and stated Engine 66 was accounted for and they were going to look for Engine 57’s Captain, who was still missing. Due to heavy fire conditions at the front of the structure, Engine 15, who was assigned as the Rapid Intervention Team, proceeded to the rear of the structure to a rolling steel door. The Inside Member of Truck 66 and members from Engine 34 had earlier used a rotary saw to open the large steel door in the rear of the structure to allow access. By 0246 hours, the personnel involved in the rescue attempt had no success in gaining entry to the structure, and with the conditions beginning to further deteriorate, IC advised Truck 66’s Apparatus Operator to start putting water on the fire from the ladderpipe. At 0254 hours, Engine 15 radioed the IC that they had found the Captain on Engine 57 (victim), but their message was not heard by the IC due to heavy radio traffic. At 0256 hours, Truck 66 radioed Engine 266 and stated that entry was made in the rear through the rolling steel door and the RIT of Engine 15 would be entering. At that time, Truck 66’s Apparatus Operator was advised by IC that Engine 15 had made access through the rear door and that they needed them to shut down the ladderpipe temporarily. At 0257 hours, the Red Alert tone (a term used to notify on scene rescue personnel that a fire fighter accident or emergency has occurred) was generated by the OCD. At 0258 hours, Engine 15 was successful in notifying IC that they had found the victim and they would be coming out the back of the building (where they entered). When the victim was found, his helmet had been knocked off, the SCBA facepiece lens was missing, and his PASS device (set to automatic) was alarming. Rescue 66 initiated Advanced Life Support (ALS) procedures and transported the Captain (victim) to a local hospital, arriving at approximately 0322 hours. The Captain was pronounced dead in the emergency room. NOTE: There were two confirmed Automatic PASS device activations at this incident. One activation occurred inside when the Captain from Engine 66 lost his PASS device. The victim was eventually found approximately 21 feet east of this PASS device. It is undetermined if the victim heard this PASS device sounding and moved toward it. Of the 12 fire fighters/officers who entered the manufacturing area, the Nozzle Member and Hydrant Member of Engine 46 recall hearing a PASS device sounding in the alarm mode while they were inside the structure. The Hydrant Member from Engine 46 stated he heard a PASS device in the background when he approached the loops in the hose. The Nozzle Member of Engine 46 also heard a PASS device approximately 1 to 2 minutes before beginning to withdraw from the structure. The second PASS device alarm activation was from the victim’s device. It may never be known for certain why the Captain (victim) became separated from his company and ultimately entrapped. According to the medical examiner, the cause of death was smoke inhalation and thermal burns. Discussion: One of the most important size-up duties of the first-in officers is locating the fire and determining its severity. This information lays the foundation for the entire operation. First, it determines the number of fire fighters and the amount of apparatus and equipment needed to control the blaze. Second, it assists in determining the most effective point of fire extinguishment attack, and the most effective method of venting heat and smoke. Several factors must be evaluated in conducting the size-up, e.g., type of structure, time of day, contents of the structure, potential hazards, etc. The size-up should also include risk versus gain during incident operations. The following general factors are important considerations: (1) occupancy type involved; (2) smoke conditions; (3) type of construction; (4) age of structure; (5) exposures; and (6) time considerations–time of incident, time fire was burning before arrival, time fire was burning after arrival, and effective attack made. Discussion: Accountability on the fireground is paramount and may be accomplished by several methods. It is the responsibility of every officer to account for every fire fighter assigned to his or her company and relay this information to Incident Command. Fire fighters should not work beyond the sight or sound of the supervising officer unless equipped with a portable radio. This member should communicate with the supervising officer by portable radio to ensure accountability and indicate completion of assignments and duties. When the assigned duties are completed the fire fighter should radio this information to the supervisor then return to the supervisor for additional duties. As a fire escalates and additional fire companies respond, a communication assistant with a command board should assist the Incident Commander with accounting for all fire fighter companies at the fire, at the staging area and at rehabilitation. One of the most important aides for accountability at a fire is an Incident Management System. Discussion: The size-up of a fire can be accomplished from both inside and outside of the building. Often times due to construction features (mezzanines, attic space, partitions, etc. ), interior crews may not be able to readily find or see the seat of the fire. Roof ventilation teams will often be able to provide a size-up of smoke and fire conditions to the IC and interior fire attack teams. It is important that ventilation and extinguishing operations be coordinated to achieve the maximum gain with minimal risk. Engine Companies need to be aware of possible truck problems causing delayed ventilation (steep roofs, difficult laddering, roof covering, and poor access). Truck Companies need to be aware of possible Engine Company problems which may cause a delay in fire extinguishment (security bars, occupancy type, tall ceilings, congested conditions, mezzanines, etc.). The IC must be informed if Truck and/or Engine Companies encounter problems, which may affect their operation(s). In addition, Truck and Engine Companies need to communicate their progress or lack of progress to each other and the IC. Recommendation #4: Fire departments should ensure that Rapid Intervention Teams be established and in position immediately upon arrival at the fire scene. Discussion: A Rapid Intervention Team should be positioned to respond to every major fire. The team should report to the officer in command and remain at the command post until an intervention is required to rescue a fire fighter(s). The Rapid Intervention Team should have all the tools necessary to complete the job, e.g., a search rope, rescue rope, first aid kit and a resuscitator to use if a fire fighter becomes injured. Many fire fighters who die from smoke inhalation, or a flash over, or are caught or trapped by fire actually become disoriented first. They are lost in smoke, their SCBA runs out of air, or they can’t find their way out in the smoke, and become trapped, and then fire or smoke kills them. The primary contributing factor, however, is disorientation. To prevent fire fighters from becoming disoriented at fires, they should be taught safe search procedures, such as clockwise or counter-clockwise search tactics, or they should have search lines or hose lines. The search lines should be tied to a substantial object outside of the fire area and should be laid behind as fire fighters enter smoke-filled occupancies. The search line can be used by fire fighters to find their way out when disoriented in smoke. Discussion: There is a difference between withdrawing fire fighters and calling for an emergency evacuation of fire fighters. A normal withdraw action is ordered when a fire is spreading beyond the ability of fire fighters to control it. An emergency evacuation is ordered when an extremely serious emergency has occurred or is about to happen, such as missing fire fighter(s), explosion, or collapse. In an emergency evacuation, unlike a withdraw, fire department tools and hose are left behind and a roll call or a head count must be conducted as there may be a missing fire fighter. An emergency evacuation is a rare occurrence in the fire service, and because of its rarity confusion and delay usually occur when it is ordered. For this reason, there should be a prearranged signal, tone, or sound to alert fire fighters of an emergency withdraw; fire departments should train their members for an emergency evacuation upon receipt of the signal. Fire fighters should immediately exit the structure upon receipt of the prearranged signal, leaving behind tools and equipment, which can be removed later. Incident commanders should use the prearranged emergency evacuation signal or tone whenever they decide conditions are unsafe for interior fire fighting or an accident or emergency has occurred with a fire fighter. Discussion: Fire ground communications at the fire scene became ineffective at times because of electronic problems and excessive communications. Throughout the course of a fire attack, incident command is unable to communicate effectively and receive all radio signals from fire fighters on scene because of problems with the communication equipment. In the control of communications, the human factor is the deciding element. During the course of the operations, incident command must be heard and also must hear everyone on scene. All members at an incident should follow the radio communication guidelines, keeping transmissions short, specific, and clear. However, these areas can’t be complete if electronic problems occur. Therefore, fire departments should implement a backup communications plan to avoid unanticipated equipment problems at the fire scene. The plan should include backup electronic equipment, additional channels, training, and consideration of face-to-face communication or the utilization of runners to communicate an important message if radio communication fails. Recommendation #7: Fire departments should consider placing a bright, narrow-beamed light at the entry portal to a structure to assist lost or disoriented fire fighters in emergency egress. In a dark, smoky environment, fire fighters often become lost or disoriented and all to often they are unable to escape. A bright, narrow-beamed light at the entry point could possibly assist fire fighters in emergency egress situations, i.e., when lost or disoriented. This investigation revealed that a light assisted some fire fighters in an emergency egress situation when they spotted the flashlight of Engine 57’s Engineer. 3. Brunacini A. Fire command, Quincy, MA: National Fire Protection Association. 4. Morris G, Gary P, Brunacini N, Whaley L.  Fireground accountability: The phoenix system, Fire Engineering, 147(4). 5. NFPA 1500: Standard on Fire Department Occupational Safety and Health Program. 1997 ed. Quincy, MA: National Fire Protection Association. 6. NFPA 1561: Standard on Fire Department Incident Management System. 1995 ed. Quincy, MA: National Fire Protection Association. 7. NFPA 1221: Standard for Installation, Maintenance and Use of Public Fire Service Communication Systems. 1994 ed., Quincy, MA: National Fire Protection Association. 8. Dunn V.  Collapse of burning buildings, A guide to fireground safety. Saddle Brook, NJ: Fire Engineering Books and Videos. 9. NFPA Fire Protection Handbook. 18 ed, Quincy MA: National Fire Protection Association. 10. Kipp JD, Loflin ME. Emergency incident risk management: A safety & health perspective. New York: Van Nostrand Reinhold Publishing. Two fire fighters are shown silhouetted agains the flame and smoke at the fire scene.